Bay Front Beauty/ Summer Sea Must See!!!! Beautiful / tropical decorated one bedroom, one bath water front condo in Summer Sea Condominiums located at Mile Marker 88.5 Bayside Islamorada, FL. 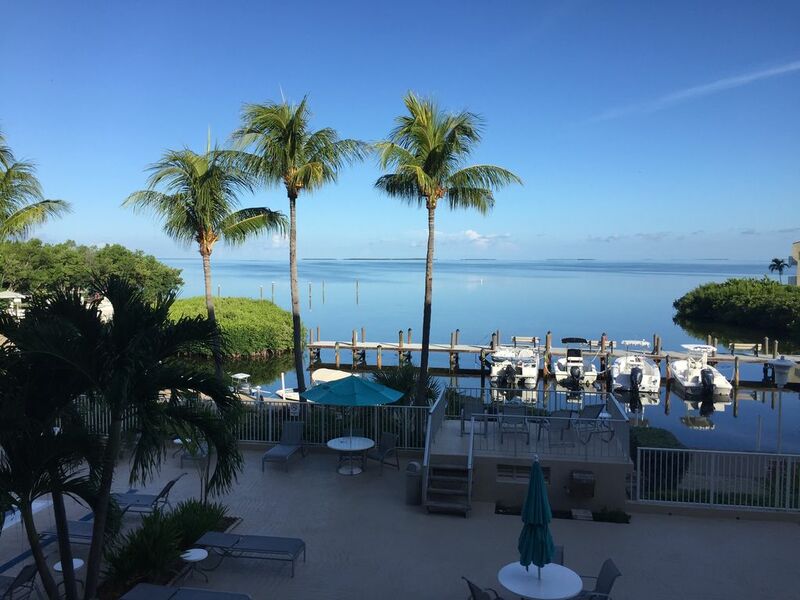 Bayside means amazing open water views & world famous Florida Keys sunsets from your own private balcony overlooking the Florida Bay. You can also view the sunset from the pool, marina, man-made beach or roof top deck. Unit features living room with Sony 40' flat panel LCD TV, NEW LEATHER SOFA (sofa bed), & LOVE SEAT (2017), leather chair,. Dining area with glass table and 4 chairs. Bedroom now with new KING size bed and 26' LCD TV. Kitchen with stainless steel refrigerator, oven & dishwasher. Bathroom with marble shower enclosure and granite vanity top. Nice size balcony with table & four chairs (New Cushions 2017). Enjoy open water views from balcony, living room and bedroom. Unit also overlooks pool(s) and marina. Unit beautifully upgraded with ceramic tile and crown molding throughout. Complex common areas (inside and out) recently painted and upgraded making the place look great! Location, location, location: walk to 'Marker 88' for water front dining, also walk across street to convenience store or casual lunch or dinner spot. Short drive to many water front restaurants, tiki bars, snorkeling, diving, fishing, boat rentals, boat tours (nature, sunset and glass bottom) and shopping. Landmarks nearby include: Theater of the Sea, World Wide Sportsman, John Pennekamp Under Water Park, Founders Park, Holiday Isle, Lore-lei, Robbie's and more. Amazing water views as far as the eye can see from balcony, living room slider and bedroom window!!! Mark moved to Florida in 2005 from the Philadelphia suburbs and currently lives in Pompano Beach. Weekend trips to the Keys led to my purchase of my dream condo in Islamorada. I want everyone who stays in my condo to have as great a time as I do when I am there. A relative owned a unit in the Summer Sea complex years ago that I had the pleasure to stay in. When I decided to buy I remembered how close it was to everything. Amazing views from everywhere in the unit. Huge pool deck with lots of tables with umbrellas, chairs and chaise lounges and very large pool. Sunsets galore from condo unit and common grounds. Quiet complex with 4 person full time staff that keep it meticulously maintained. View more about Mark D.
Large marble shower stall, vanity with granite top. Full Kitchen with full size oven, microwave, dishwasher garbage disposal and refrigerator. 40' flat panel LCD!!! And 26' LCD in Bedroom! Balcony with unobstructed views of the Bay, also overlooking the pool and marina. Balcony has a small table and 4 comfortable chairs . Beautiful sunset visible every night from balcony. This was our second time staying in Summer Sea. Accommodations were great, as before. We met some other folks at Summer Sea who were so friendly. And, of course the fishing in the Keys is second to none. We had a great time staying here during mini lobster season. The condo was nice and we had a great time swimming in the pool. The view of the sunsets were amazing! The only downside was that we could not use a boat slip if we had brought our boat but that was made clear to us while booking. Very easy to book and Mark was quick to respond to all of my questions. I would definitely stay here again and recommend this great condo. Thanks for the great review! Im glad to hear you enjoyed your stay and would love to see you return in the future. The condo rules only allow renters to use the marina from January 1 through March 31. Thanks again for choosing our condo for your summer vacation! Great view of sunsets from condo deck.Condo was well appointed and had everything we needed. Condo property was well maintained and had good security. Would definitely go back! I am glad you enjoyed your stay but disappointed that you would give me a 3 star review because you couldn't use the marina. You didn't even ask if you could use the marina when you reserved the condo. You only asked if you could Bring a boat 4 days before your arrival date. The condo rules only allow condo owner's boats in the marina. I'm sorry you assumed you could bring your boat and use the private marina because you saw the marina pictured in a photo showing the view from my balcony. My listing does not state that boat slips are available for use or rent. In the future you should ask if boat dockage is allowed or available before booking. Thank you. The property is excellent, except for the toxic fumes from one of the boats. Overall had a great time as usual. Owner is fantastic to deal with. Depending on the state of the Canadian dollar next year we may not be back. Our cost in U.S. dollars was $2,495.00 for the Condo, but that cost us $3,435.00 with the exchange rate. We also took a hit in motel costs for 6 nights return travel. If we did not already put a deposit down last year, we would have not returned this year. I feel the U.S. is going to loose quite a bit on the tourism trade in 2018. Very unfortunate as we love our visits there. It's been a pleasure having you as a guest and I hope the Canadian Dollar gains strength to provide a more favorable exchange rate in the future so you'll return to our Summer Sea Condo! I know you have stayed with us for three or four straight years and have always had a 5 Star experience. The whole experience was great ! Mark , you made it very easy from beginning to end. The condo was great and the view was remarkable.... Can't wait to return !!!! There are some technical glitches in the automatic quote and reservation process that I cannot control. If an auto generated quote does not seem correct, please email me with a request for quote for the dates you want.